Today’s lesson was all about contour lines and using pen again. 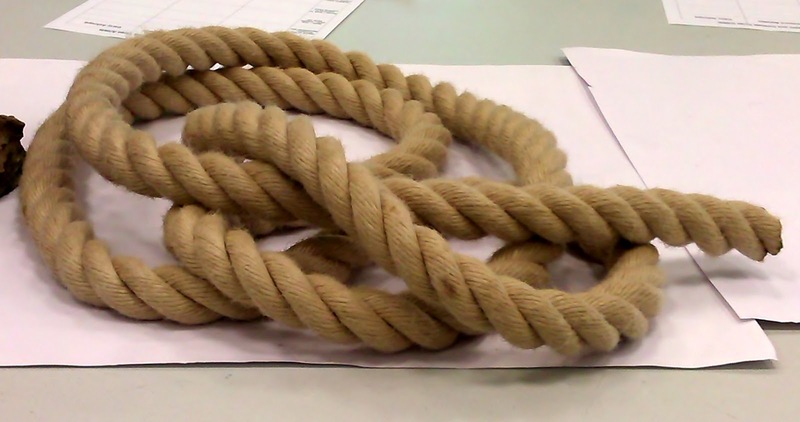 We had a selection of objects to choose from and I chose a length of rope. I was advised to do just did a section of it as it’s a really complicated subject to tackle. I decided to work on A5 Daler-Rowney Heavy-weight cartidge paper, I only got this far in class so, I finished it at home. 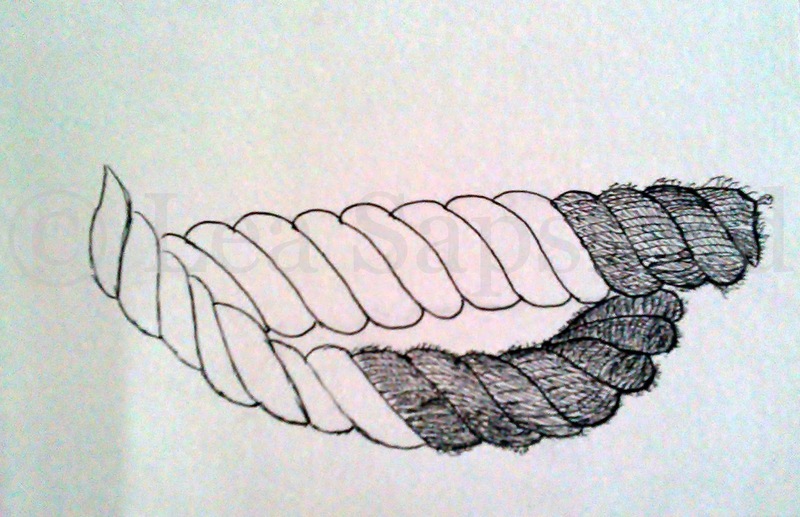 I have posted the finished drawing under the Pen & Ink Drawings tab. This entry was posted in Observation, Pen, Still Life on April 26, 2013 by Lea Sapsford. This morning my art teacher had lined up a very challenging observation lesson to kick-start the new term, we had to sketch baskets! My art teacher started off explaining how to breakdown the composition to make it easier to tackle. The first basket I attempted I couldn’t do I just couldn’t render the close weave of the basket. I switched to another one, only to be told by my art teacher that the one I was managing much better was actually far more complicated! After 20 minutes of drawing that basket my art teacher swapped them all around so we had another different basket to have a go at. I really enjoyed the challenge and I will definitely not shy away from objects in the future, if at first I think they are too complicated, I will try and break it down as my art teacher did to more manageable sections to recreate it. We had the option of doing a tonal drawing or to introduce colour in any medium of our choice. I chose to paint mine in watercolours as I wanted to work quicker and complete them in class. I knew if I did a tonal piece which I would of done normally I wouldn’t complete one let alone two. I’ve posted my basket studies under the Sketches tab. Next week is Pointillism and I have never ever attempted it so can’t wait for the lesson! This entry was posted in Observation, Watercolours on April 20, 2012 by Lea Sapsford. Today was the first lesson back, it was so great meeting up again after the break. There were some new faces too which is always nice. The first couple of lessons are being dedicated to observation. My art teacher brought in some materials to make up our own composition to draw or paint. I have chosen to do a tonal piece using only graphite, it’s posted under the Graphite Drawings Tab. 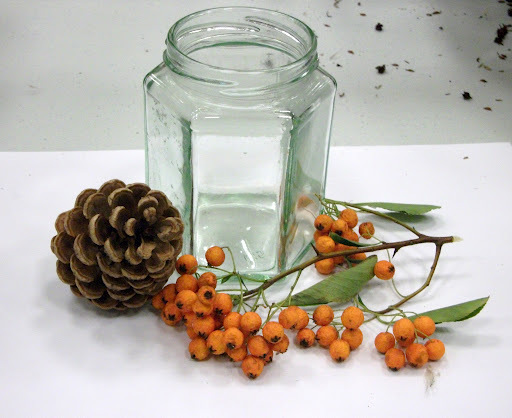 This entry was posted in Observation, Still Life on January 13, 2012 by Lea Sapsford.